Here is a list of websites I have worked on or developed. Mouse over each image to see an expanded view of the website. Each image is also a link to the website. 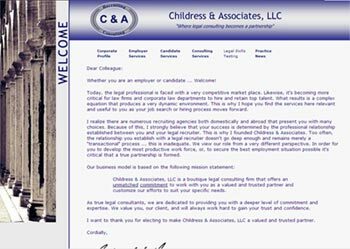 Childress & Associates, LLC came to me when they were starting out. They needed a professional website to show what services they provided and also a way for candidates to submit their resumes. 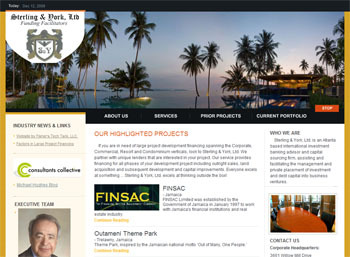 This project was done in two phases to help them mediate the costs of the web development. The second phase was a skills assesments section that allowed candidates to take online tests. From our initial meeting right through to the completion of my firm's web site, Jeff was extremely knowledgeable, flexible and understanding. He identifies with the needs and limitations of a start-up organization, but has the knowledge to accommodate any Fortune 500 company. His company will provide you with a quality web site that fits your budget. I'm very pleased with our final result. -- Brian K. Childress, President. 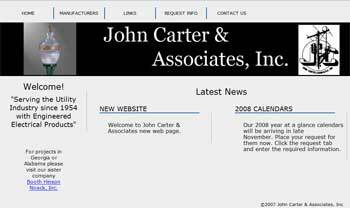 John Carter & Associates had a need to update their website with more current information and a new look. After working with them to determine what they expected from their website I created a site would provide an administrative section to update many parts of the site. This allows them to update items that can changed in their industry without the need to pay a developer again. A administrative page was also created to allow them to change the images that are displayed in the banner at the top of the page. Our website was in desperate need of an update. It was outdated, had very old information and we were not knowledgeable on how to make any changes. Jeff was a huge sucess for us! He redesigned the whole page and showed us how to operate it on our own schedule. Now, we don't need a third party to make any changes. In addition to the designing of our webpage, Jeff was able to begin hosting our site and email services. Jeff is patient, yet aggresive and wants to get the job done right. We appreciate everything he has done for us. Thank you, Jeff! 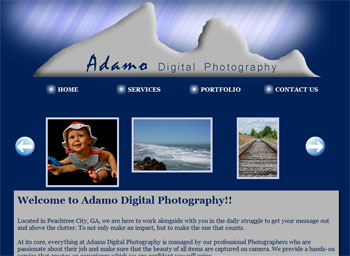 Adamo Digital Photography was referred to me by a former co-worker. She needed a website designed to display her photography and allow people to contact her to purchase prints of the photos. Along with being able to display her photographs on the page she wanted prospective clients to be able to contact her through the website. She also needed to have her email and website hosted. To accomodate her requirements I worked with her to create a website template that fit her business. After that was completed I made sure that she would be able to upload new photos and control the order and categories of the images. This would make sure that she didn't need to pay extra money every time the website needed to be updated. Lastly I added a contact page that allows people to enter contact information which is automatically emailed to her email which was also setup by Fisher's Tech Tank. I had a great experience with Fisher's Teck Tank when I needed my website created. They got my idea exactly the way I wanted it and created the website just like I had imagined it. I haven't had any issues with my website and they are always available for me if I have questions. They were fast and the price was great as well. 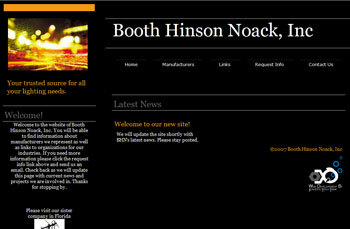 Booth Hinson Noack, Inc had a website design that had been created by an employee many years ago. This site loaded slowly and had some information that was no longer current. I worked with them to update the site with a new design as well as providing functionality to update portions of the site as needed. This includes the home page where current news can be displayed, the contact section, and the manufacturer page. 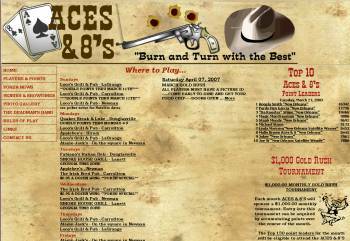 I have been working with Aces & 8's since December of 2006. 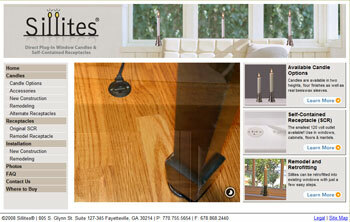 Their initial site was developed and designed by another web developer. They contacted me to add some extra functionality as their business grew. I worked with them to add the photo gallery, a page view counter, and the links section with an admin backend to allow easy maintenance. I also added some admin maintenance to allow changes to the Gold Rush tournament section as well as the Qualifiers and Tournament Results section. I continue to work with them as they continue to add functionality to the site. Jeff took over our site at an extremely critical time. Our business was growing and new competition was on the scene. He completely rewrote the code for the site and quickly added new functions. He made it much easier for our Webmaster to maintain plus enhanced our keywords to increase search engine hits. He has been very responsive and explains issues in a clear, laymen's vocabulary so we all understand what is happening. We are very pleased with the results and look forward to expanding our involvement with Jeff in the future. I started work on the Sillites website when I was approached by the designer who was working on the images and the overall design of the site. The development of the html and css code for the site was more than the designer wanted to handle at the time. The designer and I worked together to make sure the client was happy with the end result. I developed an administration section for the client so that pictures could be uploaded and the slideshow changed without any additional cost in the future. We were looking to give our website a rich and elegant feel while still having great functionality. The graphics designer brought Jeff into the process and he was able to create a moving slideshow, which is the most attractive part of our homepage. Jeff’s response time and follow up support for both our website in setting up our company’s email system has been great. I would highly recommend Jeff for any website, email or e-commerce help needed. Sterling & York, Ltd. came to me with an urgent need to have a website and email setup very rapidly. They needed to have a professional website that would showcase their prior work and highlight opportunities for investors and project developers. Working very closely with this client I was able to create a very professional template with some nice features to highlight a project on the home page as well as showing a random project each time the project page is shown. As with many other clients I added a section of the website where the client will be able to update the site in the future. Even with the added complexity of the Flash animation in the banner I was able to complete this website in approximately 2 weeks. We started our with a concept, and Jeff turned it into a homerun!! He listened to us, drank in our thoughts and comments, then put together a website that was professional, educational to our audience, and raised the outward (and inward) look of our company. He not only raised the bar, but he surpassed it many fold. My hat is off to him for not doing a fine job - but an EXCELLENT job - one that I'm very, very proud of. I would recommend Jeff to any company. He "knocked our socks off"!!!!! !